Check out Tobi's Tami Mini Dress It's all about the details. Throw it back with Capulet's Tami Red Orange Mini Dress the next time you're at a concert. 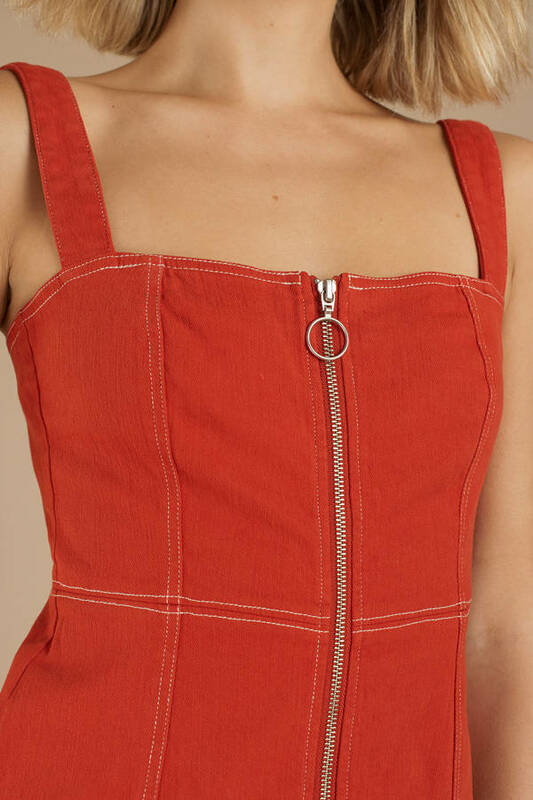 This O-ring zipper dress features wide shoulder straps, a front zipper, and gorgeous contrast stitching. Pair this mini zip dress with boots! It's all about the details. Throw it back with Capulet's Tami Red Orange Mini Dress the next time you're at a concert. This O-ring zipper dress features wide shoulder straps, a front zipper, and gorgeous contrast stitching. Pair this mini zip dress with boots! Red Orange modeled on a size Small.